Networking & Communication including a site-wide campus network; high-speed data center networks; a high-speed wide-area network; communication services such as email, calendar and chat; telecommunications services such as VoIP, cellular and analog phone services, voicemail and pagers; radio equipment and radio networks; audio and video conferencing support. 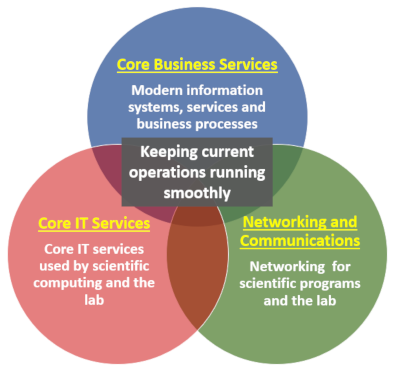 Core IT Services including file servers for Windows, Mac and Linux; physical and virtual server hosting and operating system support; central website hosting; database hosting for business and scientific services; system backup and restoration; centrally managed desktop, laptop and mobile devices; central authentication systems; and Service Desk and managed IT services. Core Business Services including financial, human resource, environment, health and safety and facilities applications; engineering; a library, publications and records management; and content management systems.